This is the first hat I have made. It was made to go with a black 16th century Italian dress that I made for livery to wear as Liveryman to Gabriel II. The hat is in the style of 16th century Spanish to tie in to the Spanish style of the reign. Finished hat, inspired by 16th century Spanish headwear, made by Ceara Shionnach. Wide brim hats can be seen in many watercolours of Spanish men and women, painted by Christoph Weiditz. In each of the examples below, the hats are black and are worn over another piece of headwear (e.g. a coif or veil). 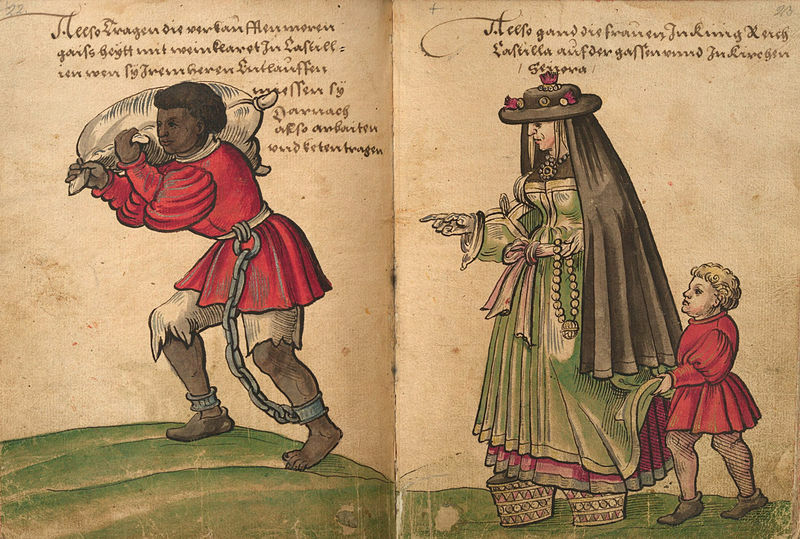 Watercolour by Christoph Weiditz of a Spanish woman (right) from his Trachtenbuch (c1530). Image sourced from Wikimedia Commons 2014. 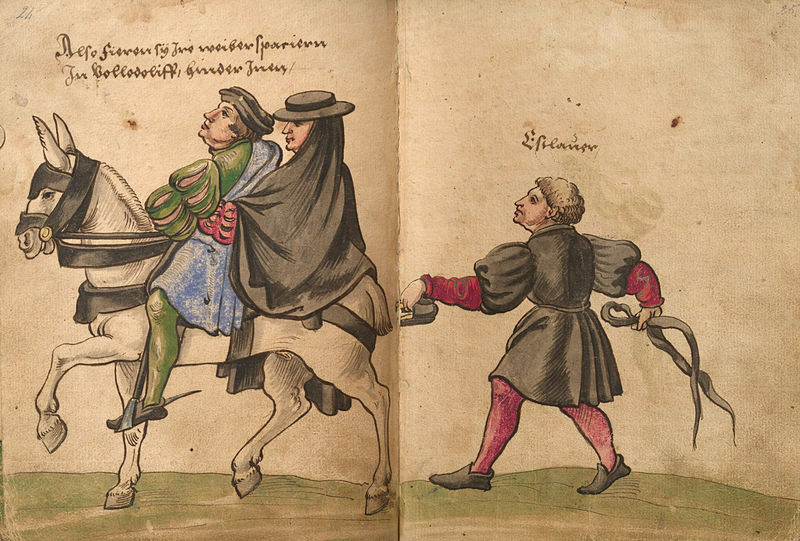 Watercolour by Christoph Weiditz of a Spanish woman (on horse) from his Trachtenbuch (c1530). 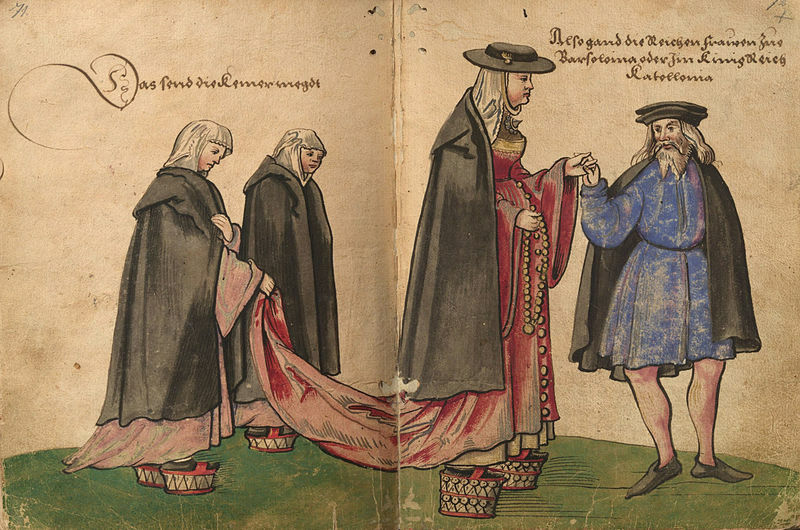 Watercolour by Christoph Weiditz of a Spanish woman (in red) from his Trachtenbuch (c1530). 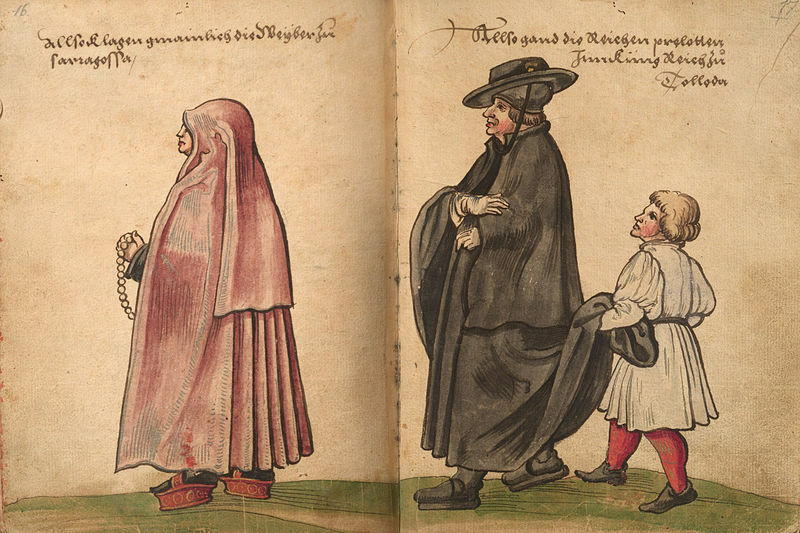 Watercolour by Christoph Weiditz of a Spanish man (all in black) from his Trachtenbuch (c1530). 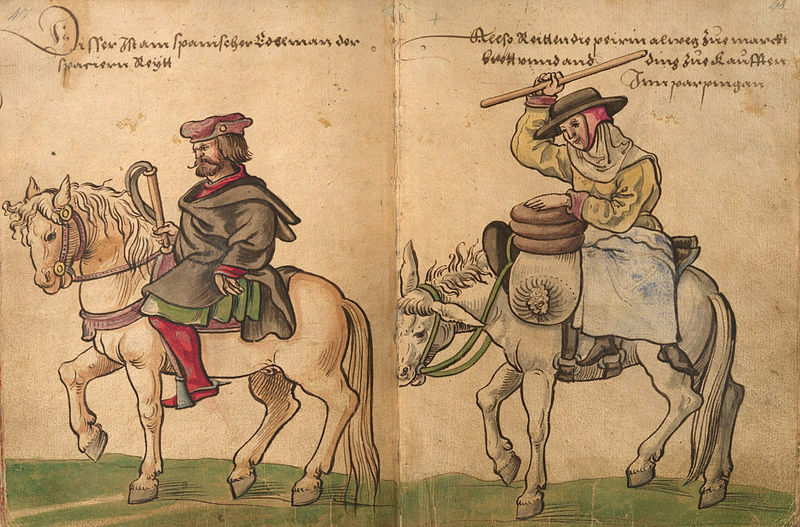 Watercolour by Christoph Weiditz of a Spanish figure(right) from his Trachtenbuch (c1530). These period examples have narrower tops than my finished hat. This is a function of this being my first hat project, and having used a cake tin as the pattern. A pattern was made, with help from Mistress Mathilde, out of carboard. The general rule with hats is that if you can construct it out of cardboard and stickytape, you can make it out of buckram. 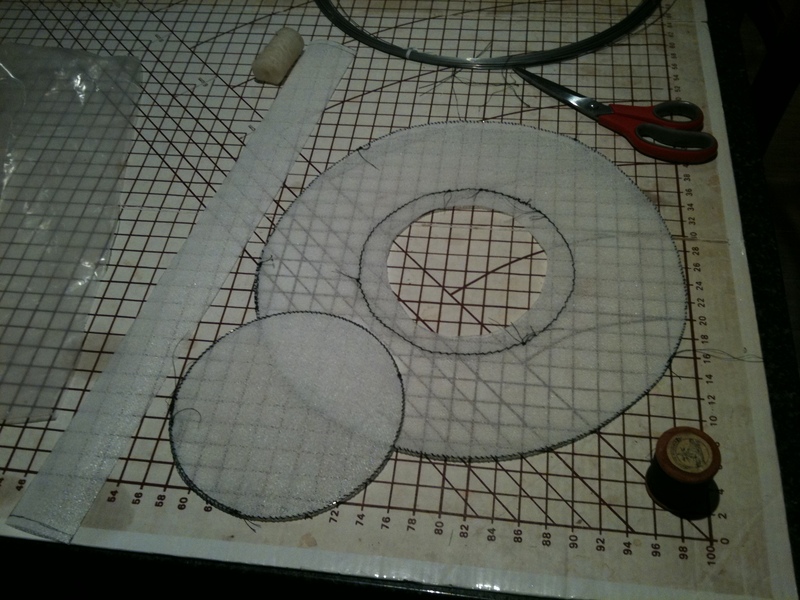 I used the cardboard pattern to draw on to some buckram and cut out the three hat pieces; a doughnut shape for the brim, a band for the first part of the crown and a circle for the top of the crown. 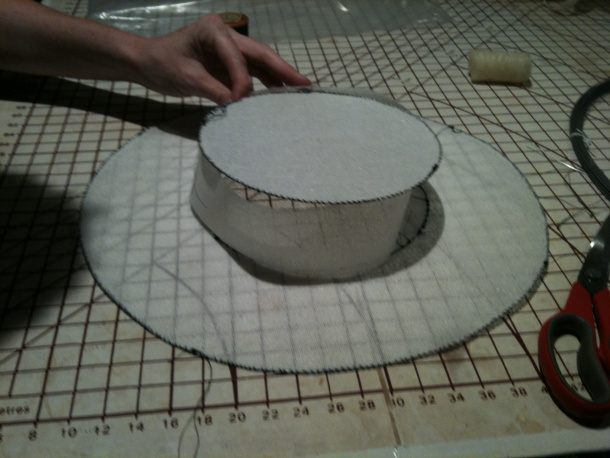 The three buckram pieces that make up the structure of the hat, by Ceara Shionnach. I couched milliners wire around the three edges of the hat; the outside of the brim, the inside of the brim and the circumference of the top circle. This reinforces the buckram and helps it keep it’s shape. Milliners wire is couched around the inside and outside of the brim, and around the crown, by Ceara Shionnach. To prevent the wire from poking through the finished hat, bias tape was sewn around (in a simple running stitch) to cover it. Bias tape was sewn around the wire to prevent it poking through the fabric in the future, by Ceara Shionnach. The pattern pieces were cut out of a fine wool felt in black, with seam allowances left. 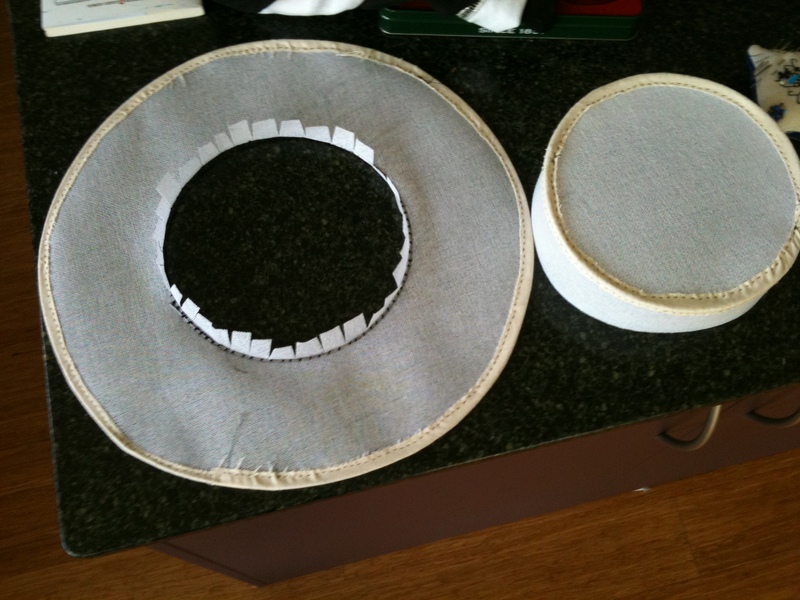 A second doughnut piece was cut out to size (without seam allowance) to be sewn onto the underside of the brim. Being careful to keep the fabric sitting flat, the wool was sewn down (with running stitch and whip stitch) onto the buckram frame. The top circle and the top of the brim were sewn down first, then the band and the underside of the brim, to ensure that the seams all ended up smooth and neat on the outside of the hat. The decoration style for my hat was primarily inspired by the first Weiditz image above, with the woman with fuzzy red things on the top and sides of her hat, and with small button-like decorations. For decoration, I made a black velvet band with some silver braid sewn on either side for decoration. 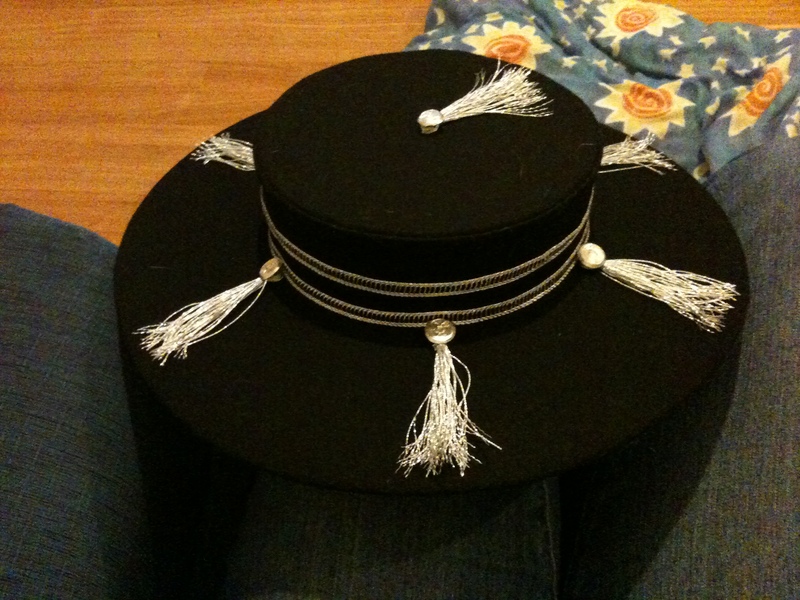 This band was made separate to the hat so that, in the future, I can make/change the decoration if I want to. I made some pewter cast buttons with millrinds on the top (the symbol of House Burbage). They were my first attempt at casting, and they were made using a three-part soapstone mould that I carved by hand. I used these buttons as decoration on the hat, each paired with a silver tassel that I made from metallic embroidery thread. Finally, another band and top circle were cut out of some linen, sewn together, and whip stitched in for lining the inside of the crown.